Inspired by a cobra, which confronts everything and everyone face-to-face, daring all challengers without the need to sneak around. A cobra is aware of its own speed, its own agility and its own venomous power to kill. The BOLT-68 AUTOMATIC BLACK COBRA and STEEL COBRA are a talisman for the snake’s defiant courage. The spitting cobra on the dial offers nowhere to hide. The COBRA pushes beyond the boundaries of politeness to a place where danger reigns and survival is all that matters. With its unconventional dial, its stainless steel and black PVD case with gadroons finishing, and its real python black and brown strap, both BOLT-68 COBRA are the perfect companion to defy conformity. BOLT-68 COBRA – it is not only an unconventional design that will make you stand out with your creative mind, it is also most importantly a Swiss made watch, combining both originality and tradition into one unique design. Automatic Movement, 10 ATM water resistance, sapphire glass and limited to only 250 pieces each, making this watch an impressive must have on every wrist. From a technical point of view, the new BOLT-68 COBRA has a Swiss made Concepto caliber 99001 automatic mechanical movement – all held in a black PVD 45mm gadroons case finishing. Not only standing out with design and materials, this new watch is also crafted with an ingenious bayonet system including a trigger guard. Patented by the brand itself, this system makes each piece even more flexible as it doubles as a pocket watch when the timekeeping module is detached from its base and attached to a metal chain. This modern and innovative system is a real development in three aspects of watchmaking: size, engineering and security. 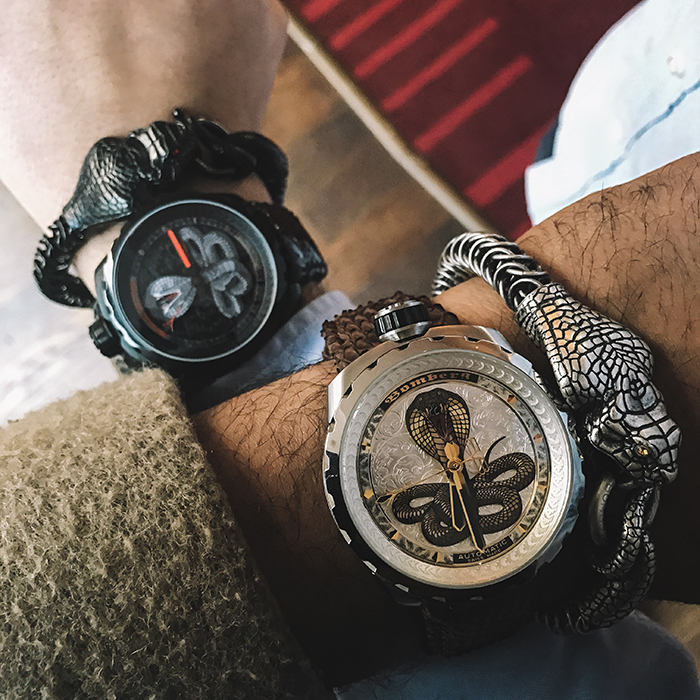 An appropriate cobra chain and a cobra medallion in black PVD and stainless steel are also available with the watch, in order to give you the chance – thanks to the patented bayonet system – to turn your wristwatch into a disruptive pocket watch.